Lots of bulbs to plant this fall, they started in Missouri and are back for a short stay. This is one of the gardening chores I don’t look forward to, deciding what potted plants come inside for winter. Early in the month it’s time to start pruning and checking for any hitchhikers that may be inadvertently coming inside, too. Welcome to fall, and the gardening chores associated with putting a garden to bed for winter. To cut down on leaf drop, bring in plants a month before turning on the heat. I tend to wait until a couple of days before hard frost is in the forecast to give my plants as much time outside as possible. Then I have to sweep up dropped leaves for weeks afterwards so don’t do what I do if you don’t like messy plants. For single plants in separate plants, consider combining them, watering well and the bringing them inside. Even if they only last for a couple of months, they will help to extend the growing season a little longer. Do I sound like I miss my garden over winter? You bet, it's why my house looks like a little jungle mid-January. If you haven’t been, you need to water. Perennials, evergreens and azaleas need one inch of water a week and we are sorely behind the average. Water with the hose in the ground so the water gets to the roots. Keep watering until our first hard frost. For USDA zone 5d, that is usually around Halloween. If you have been fertilizing, no more. Also this is not the time to prune anything, wait until January after the plants are dormant. If you haven’t cleaned up flower beds of spent plants, here’s your last chance to gather seeds. Birds will take the rest after frost. Leave the rest to clean up in spring. By then, most of the greenery will have broken down and become part of the garden mulch. Last call to bring in fresh herbs: basil, rosemary, parsley, chives and stevia will also easily transition to a sunny, inside window in pots. Geraniums, coleus, wax begonias, impatiens all will winter over inside if you keep them pinched and bushy. Geraniums will winter over stored in brown bags without soil. Really. I didn’t believe it until I tried it one year. I still prefer to bring them in still in pots so I can coax them to bloom through winter. So hardy, they will, too! Time to get spring bulbs into the ground. Add a little bone meal at the bottom of the hole to slowly feed the bulbs. Plant bulbs close together if you don’t mind digging them up to separate in a couple of years. If you would rather not, give them some space in between. Mark where you planted them. Leave the falling leaves where they are. If you are worried about your grass, run the mower over them. 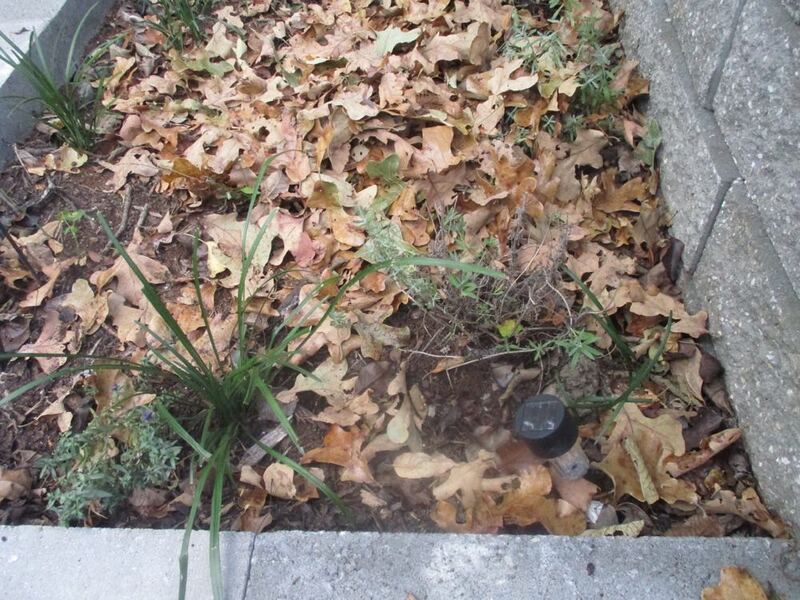 Leaves return Nitrogen to the soil and make a wonderful amendment to flower beds and help retain moisture. I started planting perennials this summer with holes lined with wet, dry leaves. Worked beautifully!